This week why paid parental leave for dads is great for women and how to foster a lifelong love of reading in your preschooler. 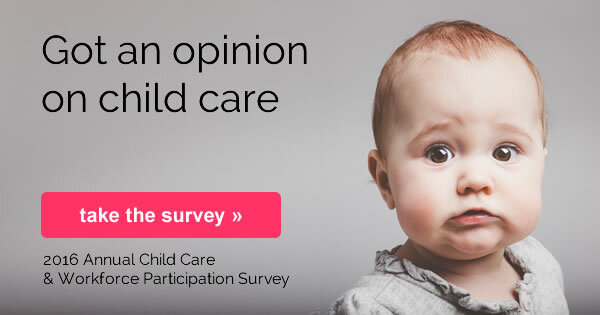 Also, remember to share your story in our Annual Child Care and Workforce Participation Survey. A new OECD policy brief shows that despite the fact that 23 OECD countries now offer paid parental leave, for use by both parents, uptake among fathers is low. The brief shows that while men often take a few days of paternity leave right after the birth of a baby, "it's only the most committed and bravest" who use their full entitlement. In fact, the OECD report claims that fathers account for less than one in five of those taking parental leave with the highest percentages (40 per cent or more) in some Nordic countries and Portugal, while only one in fifty men take their full entitlement in Australia. The good news is that the trend is improving on average; it's just taking a long time and is happening very slowly. The reason why this is important for women is that by enabling fathers to take on a greater share of the responsibility for caring for children, parental leave can make it easier for women to return to the workplace and balance their work and professional responsibilities. Though your toddler might be too young to read for themselves, fostering a love for books can be sparked as soon as they can turn a page. A love for books and for reading is something they can carry with them through life, and making books a natural part of life can have a myriad of benefits. Not only is snuggling up and reading a book together wonderful for your relationship, studies have shown that those children exposed to reading at an early age are more likely to do well in all areas of education. Books also teach basic speech skills, improve communication skills and language comprehension, enhance imagination and assist in ability for logical thinking. As parents there are several simple things you can do to encourage an interest in books in your child and make reading a fun part of your shared daily lives.